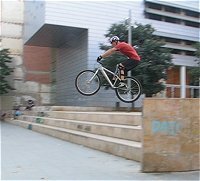 This approach is brutal and doesn't leave much room for control: at worst, you just need to go fast enough to clear the gap and land flat...you can also boost your jump with a bunny hop during take off, or clean your landing by dropping the rear wheel first. Obviously, it's the easiest technique to learn, but quite useless in real biketrials. 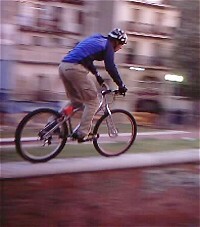 1° Stop pedaling just before take off to concentrate on your balance. 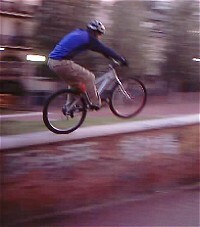 Start shifting your body backward to keep the front wheel horizontal as it comes in the air. 2° When you decide to go off the wall, sideways or frontally, start a manual by pulling on the bars and keeping your weight backwards. The front wheel stays up in the air. 3° Once in the air, just let the bike fall naturally to the ground, extending the legs before the bike impacts with the ground (so that you can flex again for damping). Make sure you cruise at more than 20km/h, the idea is just to fly down that gap. As soon as the back wheel touches down, try to damp the impact with both the legs and arms, stay in the middle of the bike and keep rolling (then brake progressively). This approach is not very safe when jumping from high. In extreme downhill or freeride, the guys nearly always land in a slope, so that the suspensions do the work progressively. If for some reason, you pull too much on the handlebars during take off, you may end up landing in an uncontrolled wheelie (which is really risky until you use the rear brake). try to avoid landing flat, as this is rather unforgiving for the wrists. If you don't pull enough on the bars during take off, the bike can dive forward, and you'll land on the front wheel, which is ugly, and from high, a guaranteed crash. If you stay flexed in the air, you'd better have some good suspensions to do the work for you when you land. If you lay too much backwards, you'll fall off on your back in a kind of desperate wheelie (not good either). 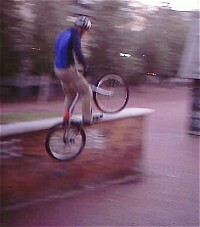 As usual, start jumping off small kerbs and progressively build it up. You'll have more control if you learn how to drop off from a pedal kick.